Feeling pastels right now? We partnered with Crocs™ to put together the perfect style guide right in time for Easter. It's easy to fall in love with the soft nature of pastels. Whether it's a pale blush or a delicate mint, these fragile hues can't help but infuse you with a sense of calm. If you're finding that these delicious shades catch your eye every April, you're not alone. There's a reason everyone wears them come Easter — you just need to figure out how to make them your own. 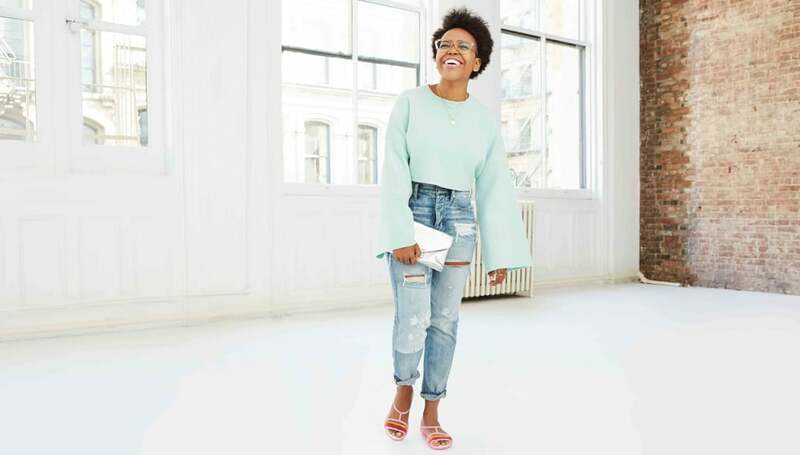 For guidance, we asked five POPSUGAR staffers to show us how they're styling their favorite pair of pastel strappy sandals. Inspired by the season, Victoria opted for distressed white jeans and a pale blush top that would complemented the variety of shades in her sandals. What Victoria said: This outfit would be cute for a day of running errands around town because the shoes are superlight and comfy. I could also see myself going to the beach for sunset in this look! Mekishana loved the demure pastel pop of her sandals and went with an equally playful color on top. Her oversize, bell-sleeve mint sweatshirt oozes with Spring influence, making it a perfect choice for her new favorite warm-weather shoes. What Mekishana said: It's impossible to get upset when you're wearing something that pops so brightly. I would have to ensure as many people as possible saw me in this. Pastel pink sandals gave Nikita the idea to go for something romantic. She wore a pleated, tea-length skirt in blush and an off-the-shoulder beige sweater. By tucking in the sweater, she was able to show off her waistline nicely. What Nikita said: Pastels are great for Spring, and this outfit was feminine and chic. It's always fun to dress up in a head-to-toe monochrome look, and this peach hue was a great color to wear. I just wanted to twirl around in my skirt the whole time, and the choker was a fun way to add a touch of edge to the outfit. Carrie went prep here, styling her pastel sandals with a pink sweater and white button-down blouse. Her distressed jeans tone down this classic look, making it a nice mix of clean and on trend. What Carrie said: This outfit is pretty versatile — from the street to work or anywhere I'd want to look more pulled together. The ripped denim gave it a bit more of a street-style edge, and these jelly-style shoes are so comfortable that I'm planning to wear them for an entire day around New York. Nicole opted for a fashion girl's must do and played with basics. Since her shoes were the focus, she knew she could keep the rest of her outfit simple. Here, she tucked a t-shirt into her ripped jeans. What Nicole said: I would wear this fashion-forward outfit to work, for walking around the city on a Saturday, and to casual events. Now it's your turn! How would you style these chic sandals for spring? Crocs has a wide variety of styles that show off your individuality and uniqueness to #ComeAsYouAre.